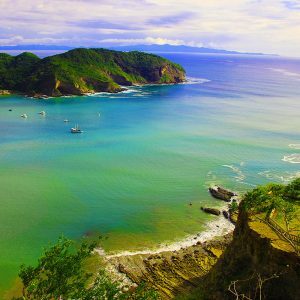 Duration: 10 hours Costa Rica Guides provides White Water Rafting experiences that are guaranteed to take your adrenaline to top levels and Canopy Tours where you will be perched high above the tree tops. Now you can enjoy the two activities on the same day. Costa Rica provides White Water Rafting experiences that take your adrenaline to top levels and fascinating Canopy Tours going high above the treetops. Now you can enjoy the two activities in an extraordinary way. 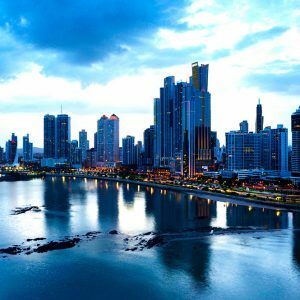 Discover the natural marvels of Sarapiqui; an extensive territory located in the northeastern area of the country, with a variety of crystal clear rivers, an abundance of beautiful tropical forests and villages inhabited by friendly and laborious people. Leaving San José the tour traverses the majestic scenery of Braulio Carrillo National Park and arriving at Sarapiqui we will enjoy two adventurous attractions: the Canopy Tour in the middle of a secondary forest with trees of high altitude and after lunch the White Water Rafting in the agitating waters of the Sarapiqui River. The Canopy Tour takes about one and a half hour. We go through nine cables of diﬀerent lengths, stretching over the forest, with the last one crossing the Sarapiqui River. The rafting at Sarapiqui River has diﬀerent levels between class II and class III, presenting a vibrant scenery to those who want to participate in this exciting activity. Nine miles of unexpected rapids in combination with calm and relaxing intervals makes this an unforgettable experience for bird watchers, nature and adrenaline lovers. In lieu of the white water rafting, you may opt for a horseback riding tour. Same rate applies. Discover Costa Rica’s largest network of naturally ﬂowing thermal mineral springs in Arenal’s largest and most beautiful private, rainforest reserve. Relax in the soothing waters at Tabacon Hot Springs while enjoying of wonderful nature. This is one of the most popular tours we oﬀer. This tour shows the best of both worlds, in terms of the raw untamed beauty of the imposing Arenal Volcano, which is juxtaposed against the lush and soothing thermal waters of Tabacon Hot Springs. All this, set against a backdrop of lush vegetation and breathtaking views of the nearly perfect conical shaped lines of the volcano. 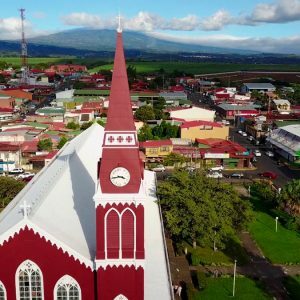 Enroute to the Arenal Volcano, we will stop at the famous town of Sarchi, known as the birthplace of Costa Rica’s Artisans. In Sarchi, you will be able to appreciate many of the art crafts and souvenirs that Costa Rica has to oﬀer. Also you will see the world’s largest ox cart according to the Guinness Book. The cart is 2 stories high, nearly 45 feet long (14 meters) and weighs 4400 lbs. (2 tons), and took 70 days to complete. Made out of wood (cedar) and decorated with bright colors, designed based on our typical and traditional oxcarts. The journey will then continue, traversing diverse plantations with agricultural products, including pineapple and plantain farms, mango groves, ornamental plants and even cattle ranches until arriving to the small town of La Fortuna, and stopping to enjoy lunch at a cozy restaurant with a magniﬁcent view of the volcano. 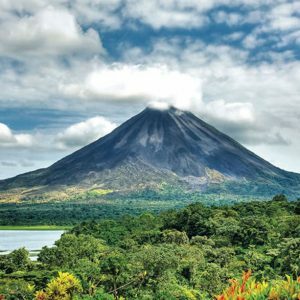 The impressive Arenal Volcano is a magniﬁcent natural wonder that is situated in La Fortuna (The Fortune) of San Carlos, previously assumed to be dormant, until in 1968, when it experienced a major eruption. Now is visited by tourist from all around the world hoping for the opportunity to witness volcanic activity, such as the white plumes of smoke that emanate from the conical shaped behemoth. 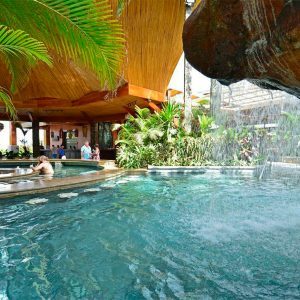 Then you will go on to relax at one of the best hot springs in the area where you will revel in the cleansing and rejuvenating eﬀects of the thermal waters, as well as an optional massage or other special treatment, if you choose, that must be reserved ahead of time to ensure availability. Spa treatments are not included and are payable directly at the resort. 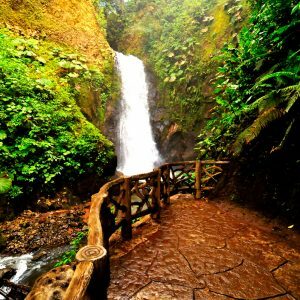 Tabacon Hot Springs combines the four elements of nature; the heat of the volcano, the ﬂowing waters of the hot springs, the pure air of the rainforest, and the fertile earth of the Fortuna de San Carlos Region. There are ﬁve main springs source highly mineralized water that is heated underground by the Arenal Volcano’s magma. You will ﬁnd dozens of cascading waterfalls and warm pools along the riverbed, of varying temperatures, water ﬂows and degree of privacy. 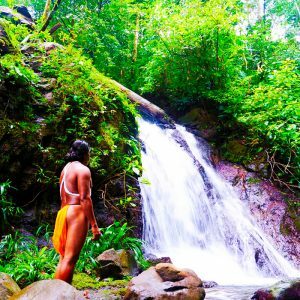 An essential part of exploring the wondrous world of the Tabacon Hot Springs is soaking in the cascading thermal waterfalls. This natural hydrotherapy is a sureﬁre way to achieve proper relaxation. The river-pool temperatures range from 72 to 105 degrees Fahrenheit. And for a perfect ending, before going back to San José, a wonderful dinner will be served with a great view of the volcano so that you do not miss any opportunity to look at the classically shaped volcano. 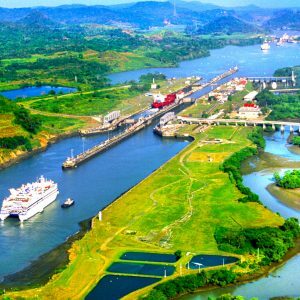 Enjoy a tour of the historic Panama Canal, one of the seven wonders of the modern world, connecting the Atlantic and Paciﬁc Oceans, until you reach the Isla de los Monos. 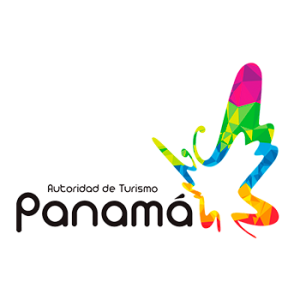 You can enjoy and learn about the wild life of Gatun Lake. 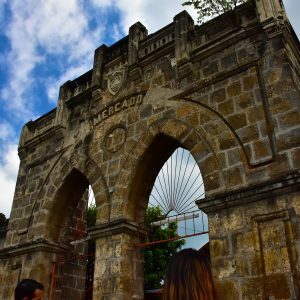 This tour will take you to explore some of the islands formed after the creation of what was once the largest artiﬁcial lake in the world. With a little luck, you will be able to observe monkeys, crocodiles, alligators, sloths and countless native birds. Set into the placid cloud forests of Costa Rica’s Central Valley region, the San Luis canopy tour will take you on an exhilarating and safe adventure through lush, green canopy and across the majestic Cataratitas River. Carried securely by a system of zip lines, you will soar weightlessly through the expanse of virgin forest that grounds the tour, and ﬁnd yourself in intimacy with the habitats of Costa Rica’s distinct cloud forest wildlife. 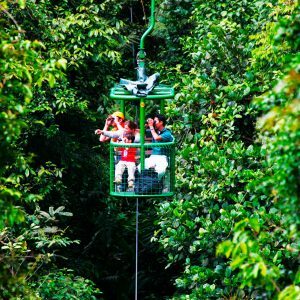 The San Luis Canopy Tour also presents the Elevator, a thrilling feature that securely lifts visitors high above the forest canopy, granting a paramount view of the surrounding area. 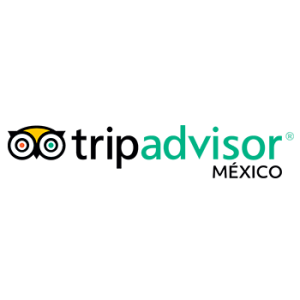 Though customer enjoyment is the main objective, San Luis Canopy Tour ensure safeness above all as a keystone principle: all personnel and facilities carry up-to-date certiﬁcations from the Costa Rica Institute of Tourism. 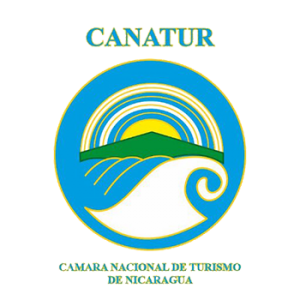 San Luis Canopy takes pride in their credentials and by them guarantees with conﬁdence that this tour is among the most professional, informative, and enjoyable in Costa Rica. San Luis Canopy has 12 diﬀerent zip lines and 18 platforms, plus their famous “Tarzan Swing Trails” and “Fly like Superman”. 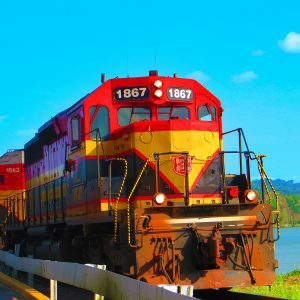 Since the traveler enters the city of Estelí, in the north of Nicaragua, he begins to feel the fresh air that comes from the Segovian mountain range, which brings, among smells of pine and oak, the unmistakable aroma of tobacco. 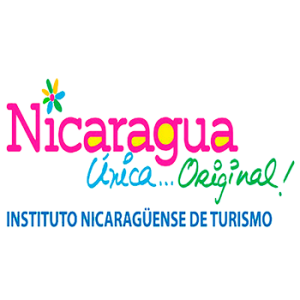 Managua, capital of Nicaragua, located southeast of Lake Xolotlán and embellished by many crater lakes that give rise to its name, which means “next to the lake” in Nahuatl. In its center there are shopping areas, museums, art galleries, theaters, markets and the largest number of hotels in the country. Matagalpa is one of the departments of Nicaragua that stands out for its high productive potential of coffee, this is one of the main exports of the country, and Matagalpa is the second department in the national production of this grain surpassed by the department of Jinotega. 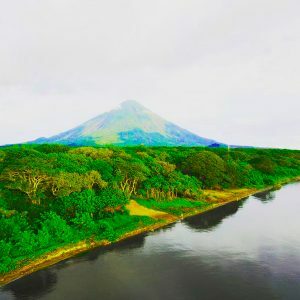 We will travel to relax at the beautiful and enchanting island of Ometepe, to enjoy all its natural beauty that made it postulate as contestant of the last 7 wonders of the world for being the only island within a freshwater lake and that inside it has 2 volcanoes one of Water and the other of fire. 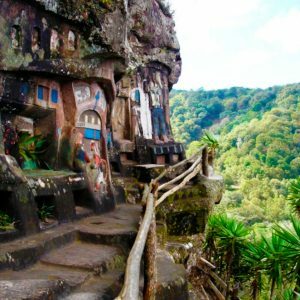 As we ascend the mountain, we will notice a change in temperature and vegetation; we will see coﬀee plantations as well as fern, ﬂower and strawberry farms along the way, creating a beautiful array of colors and visuals. We will visit the Doka Coﬀee Estate for a delicious breakfast. Then we will be treated to a coﬀee tour in an actual coﬀee plantation where we will learn the ancient techniques used by the experts to produce some of the best coﬀee in Costa Rica and around the world. The careful process involved in the cultivation, harvesting and roasting of the Golden Bean will then be illustrated, very hands-on, and then we will savor the delectable product. 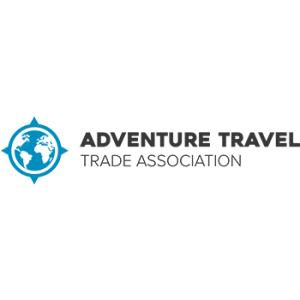 After the coﬀee tour, we will continue to La Paz Waterfall Garden for a buﬀet lunch (rated 4 Forks by the Costa Rican Tourism Council) that includes multiple selections of Traditional Costa Rican dishes and much more. At La Paz Waterfall Gardens we will go through walking trails surrounded by lush tropical rain forest. Here we will appreciate ﬂowing white rivers, spectacular waterfalls, birds, butterﬂies, monkeys, and hummingbirds. There are also, educational animal exhibits to enjoy such as the Aviary, the Butterﬂy Observatory, Hummingbird Garden, Serpentarium, Jungle Cats Exhibit, and the Frog Exhibit. 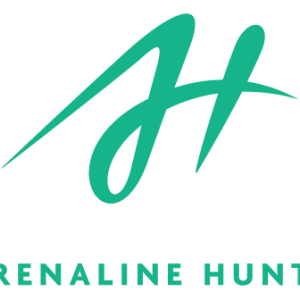 This is deﬁnitely a tour enjoyed by nature lovers from all ages. Descripción: (7hrs) We take the Pan-American Highway towards the city of Alajuela. En route we will pass the Agriculture Monument, the Monument to Juan Santamaria, our national hero and the famous Mango Park. The Doka-Grecia and Sarchi tour is a relaxing yet very enjoyable tour in which you will learn about our history and traditions. Also a great opportunity to get some coﬀee and souvenirs to take back home. 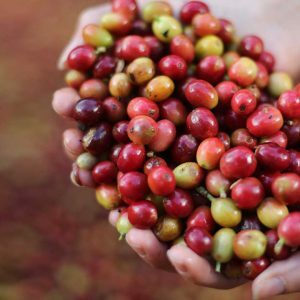 First we will go to Doka Coﬀee Estate, where we will have a coﬀee tour in an actual coﬀee plantation where we will learn the ancient techniques used by the experts to produce some of the best coﬀee in Costa Rica and around the world. The careful process involved in the cultivation, harvesting and roasting of the Golden Bean will then be illustrated, very hands-on, and then we will savor the delectable product. After the coﬀee tour we will enjoy a Costa Rican lunch buﬀet. 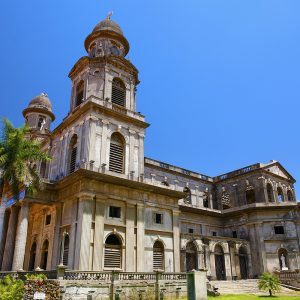 Then we will continue to Grecia, a very typical and traditional town, where we will admire the metal church, a building that has a rare architecture, with high ceilings, ornate stained glass windows, and classical lines. Next we will visit the town of Sarchi, known as the birthplace of Costa Rica’s Artisans. In Sarchi, you will be able to appreciate many of the art crafts and souvenirs that Costa Rica has to oﬀer, as we visit a factory and souvenir shop managed by the local artists. Also you will see the world’s largest ox cart according to the Guinness Book. The cart is 2 stories high, nearly 45 feet long (14 meters) and weighs 4400 lbs. (2 tons), and took 70 days to complete. Made out of wood (cedar) and decorated with bright colors, designed based on our typical and traditional oxcarts.